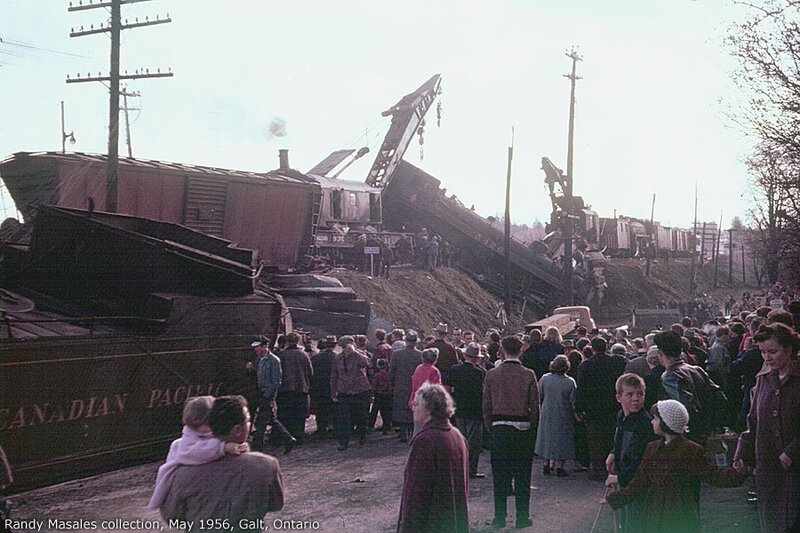 The Galt wreck took place on the Canadian Pacific Railway in Galt, Ontario at 9.35 p.m. on May 2nd, 1956. It was the last big wreck of the steam era on the C.P.R., occurring shortly before I began railroading. It was talked about for many years afterwards and although I knew several of the men involved, I never discussed it with any of them. This was written after a more recent lengthy discussion with one of the last known surviors, Ron Westworth, with further material from Tragedy in Galt by Paul Langan. 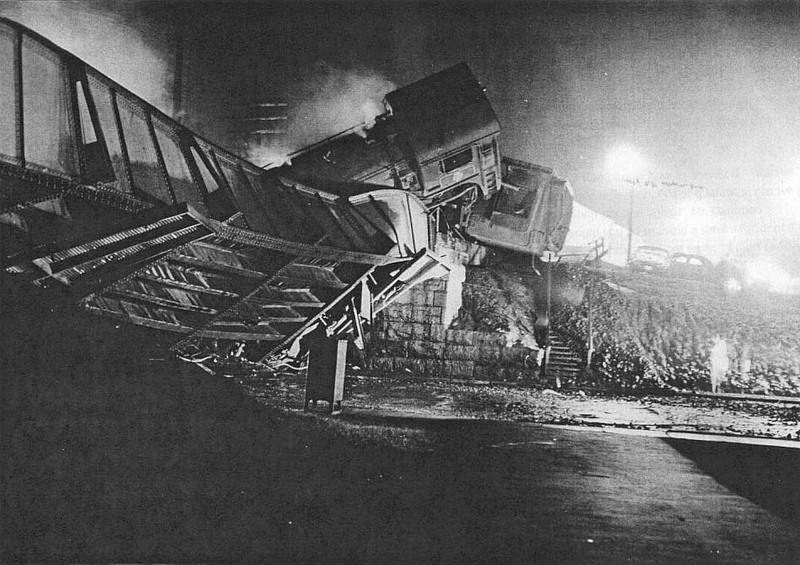 Scenes from the night of the wreck. Tragedy in Galt courtesy of Paul Langan. NOTE: all photos on this page are click to enlarge. Randy Masales photos used with permission of Brian Switzer, Brian's Rail Photography. 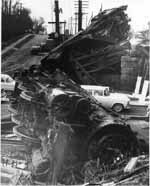 Although it did not involve the biggest loss of life in Ontario train wrecks, (two employees but, no public), it was a spectacular wreck never-the-less due to where it occurred. 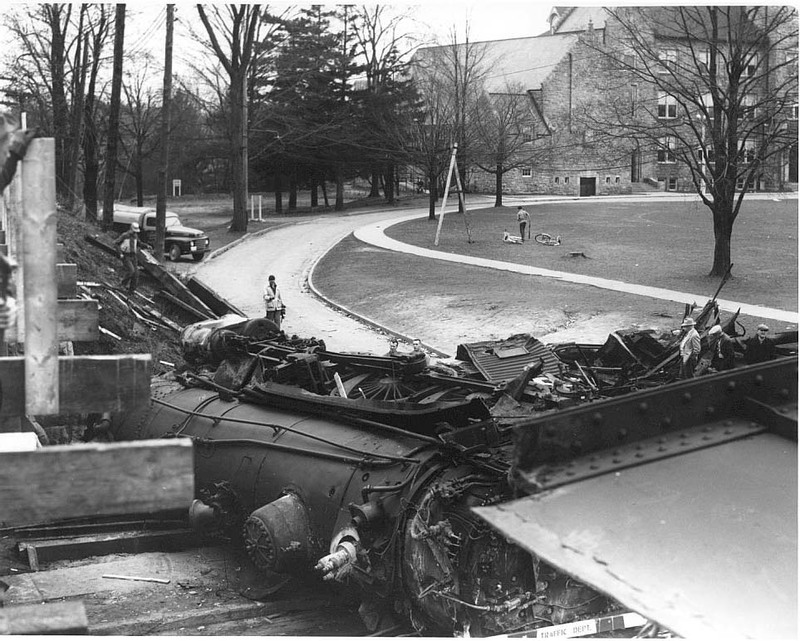 The wreck took place right in front of the station in Galt on a bridge over Water Street, off of which two steam locomotives fell when the two freight trains collided. 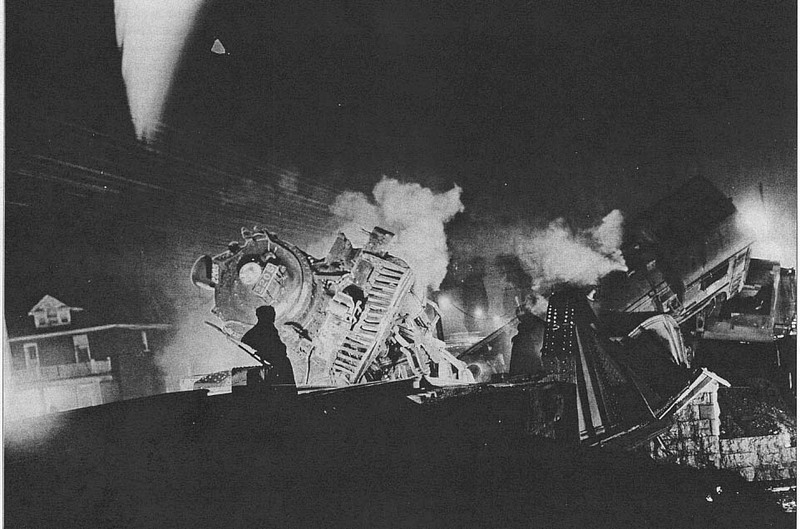 The collision involved two trains, four steam locomotives and 14 crew men! A 15th person involved was the Agent-operator in the station. The wreck happened when one freight train that had been safely waiting in the passing track for a following train, came back out onto the mainline and was struck by the fast approaching train. Extra 5186 West, assisted by 2607, was a drag freight (train 71) having work to do at Galt. Second Class train 903 was a westbound scheduled through freight, with 2205 assisting 5420. NOTE: To the uninitiated, these trains might both have been described as being "doubleheaders", since both had two locomotives. However, in fact they were correctly known as a "London and Assist" and "903 and Assist", and further in train orders as "Extra 5186 West" and "903 engine 5420". The drag had a set-off of 14 cars to make at Galt. 903 had no work at Galt and being a Superior, (scheduled) train, had priority over the unscheduled Extra. It was the latter's responsibility to stay out of the way of a Superior train. 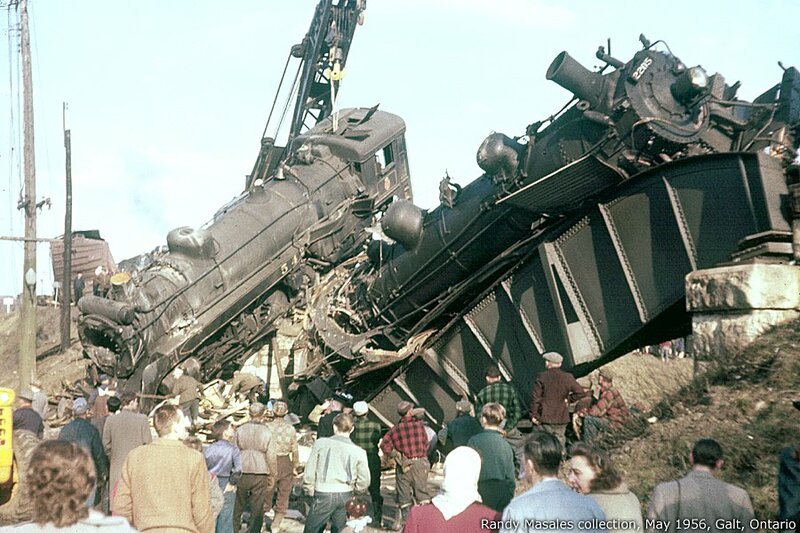 That they did not do so, was a tragic error on the part of that crew, causing the death of two of their fellow railroaders who were entirely innocent of any wrong doing. Such switching moves at Galt were a common occurrence and often were done haphazardly despite knowing another train was near. Crews always got away with it in the past, but not this time! The safety factor on this line was the Automatic Block Signal System (ABS) that gave a red signal to a following train, slowing or delaying it until the other train got out of the way. This time it was different. The move was made "in the face of" the fast approaching train, which had already passed the last signal when the switch was thrown to allow the waiting train to come out of the passing track where it had been safely sitting, back onto the main line. There was no warning for 903 until they saw, in the darkness, the drag right ahead of them! 2205 and 5420 struck the rear of the cut of 14 freight cars the Extra was pulling up the ladder track in front of the station. The collision was so violent it collapsed the bridge, causing both engines to fall down into the street below. The engineer's last words to his mates were to "Jump! Jump!" as he "big holed" the train brakes into emergency. Unfortunately, only the fireman managed to jump in time. Both the engineer of the assist engine (who was scalded by steam and cut in two), and the head-end brakeman of 903, who was riding the assist (a.k.a. push engine) and also scalded, were killed in the wreck. 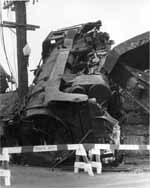 The engineer of 903 was seriously injured with a broken back and other broken bones, and while near death he eventually recovered after many months. He went on to become the Superintendent of the London Division. A 15th person directly involved was the Agent-operator working in the station. He had an annunciator device that indicated when the approaching 903 had passed Killean, the station immediately (5 miles) to the east of Galt. Upon ascertaining that 903 was approaching, he vainly attempted to flag down the Extra as it came out of the passing track but, his efforts were too little and too late! What caused the wreck was the fact that the Extra had been in the passing track with the switch behind it properly aligned for the main line thus giving the following 903 a green signal to proceed. Had this switch been left aligned for the passing track until the switch at the opposite end of the passing track was opened, a red signal would have been displayed. Nothing would have happened except for a delay to 903, a not-uncommon occurrence for freight trains. (Just don't do it to a passenger train!) There was no train radio in those days, nor any other easy way to communicate between the ends of the train, just the whistle and a hand lamp or fusee. There is conflicting information about the existance at that time of another safety factor, the block indicator connected to main line switches. This equipment had a miniature red semaphore that would, after 3 minutes of being activated, either give a "clear block" indication, or stay red, indicating something was approaching "in the block". In any event, the rule book (UCOR Rule 513) required a 3 minute wait after opening the switch before fouling the main track. The Coroner's Inquest jury did not mention this, at least not as published in Paul Langan's book, Tragedy in Galt. In talking to crew members involved, I was told the man throwing the switch was told to ignore the 3 minute wait so they could make a fast move before 903 got there. Whether or not the switch was equipped with an indicator really does not matter since the crew knew 903 was near them and should have stayed in the siding until it had safely passed. The man who threw the switch was not the brakeman whose duty it was, rather it was the fireman of the Assist engine. The brakeman had gone to the station to talk to the operator about 903's location but, being a junior man was apparently confused by what he was told. He took the blame and was fired. The other key culpable person was the lead engineer who brought them out onto the main line. After being dismissed, he pumped gas at a small gas station on St.Clair Ave. West just east of Lambton roundhouse. Protocol allowed his reinstatement after two years less a day, "on the street". He later went on to become the BLE General Chairman! The men involved had a range of seniority and experience, and with so many involved someone should have prevented this tragedy. At least 6 of the 14 could have easily. Had the agent, a senior man of 30 years service, had a lit hand lamp handy, or had he lit a fusee to wave a "washout" signal instead of yelling at the passing engines it would likely have turned out differently. Although found blameless by the jury, he nevertheless took it to heart and was said to have suffered mentally for many years over it becoming nearly insane. In an ironic turn of fate one man died and another lived. It was always standard practice to alternate the work load amongst the two brakemen. The junior man went to the shop to get the engine and was the head-end brakeman in one direction, he then became the tail-end brakeman returning home. 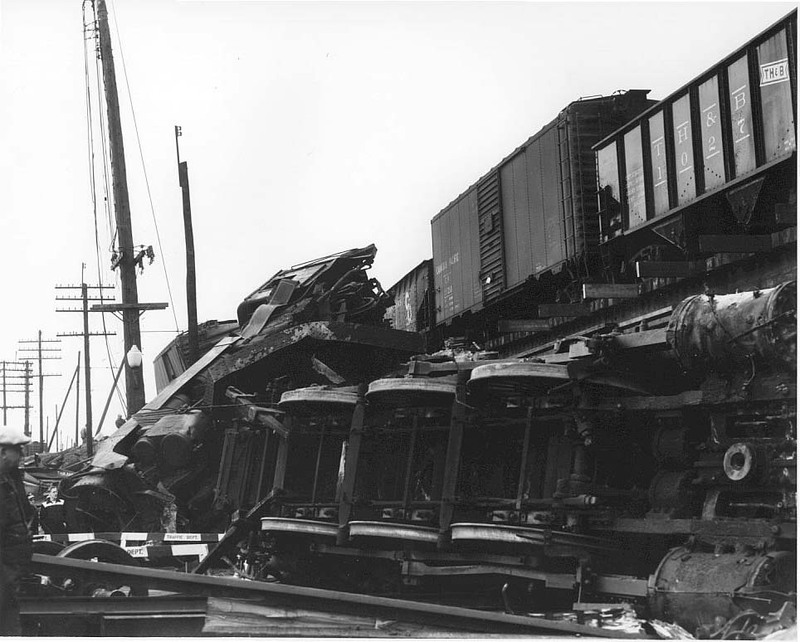 The crews involved were divided between London Division men for the trains, and Toronto Division men for the Assists. The latter worked the Push Pool, a.k.a. "Cockney" Pool, so named for the abundance of Englishmen who once worked it. On this occasion, the junior brakeman traded places with the other brakeman and worked back on the headend. It was his first roundtrip and he wanted to wave his hand lamp at his father, a signal foreman, as the family home was within sight of the tracks just beyond the station at Galt. He didn't make it. He was killed instead. The other brakeman is one of the last survivors of the Galt Wreck, and he related this ironic story to me. The young brakeman's father, who waited beside the track in vain that night, took it badly and some years later he stepped in front a Budd Car (RDC) to end it all. 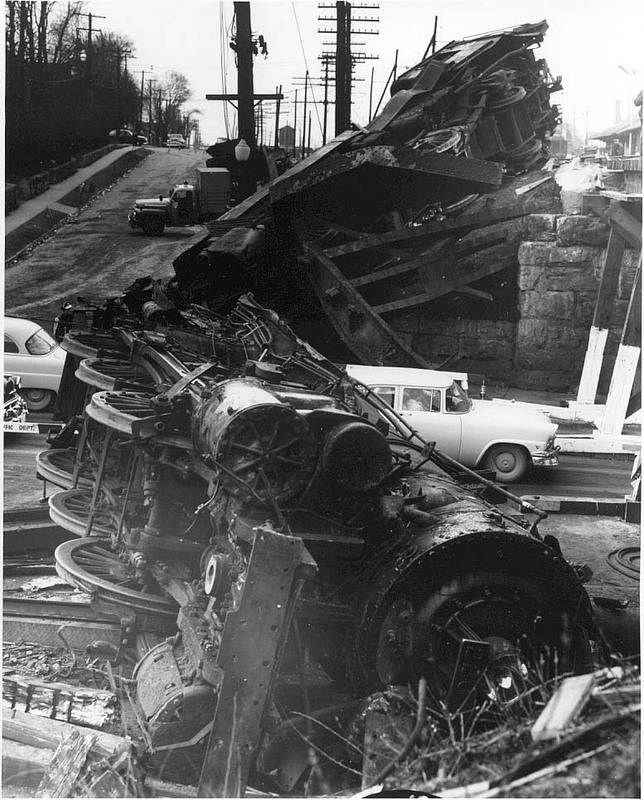 Engines 2205 and 5420 were both cut up for scrap, the wreck damage being so severe even though 5420 was a relatively new engine being only 13 years old. 2205-5420 just two months before their doom. 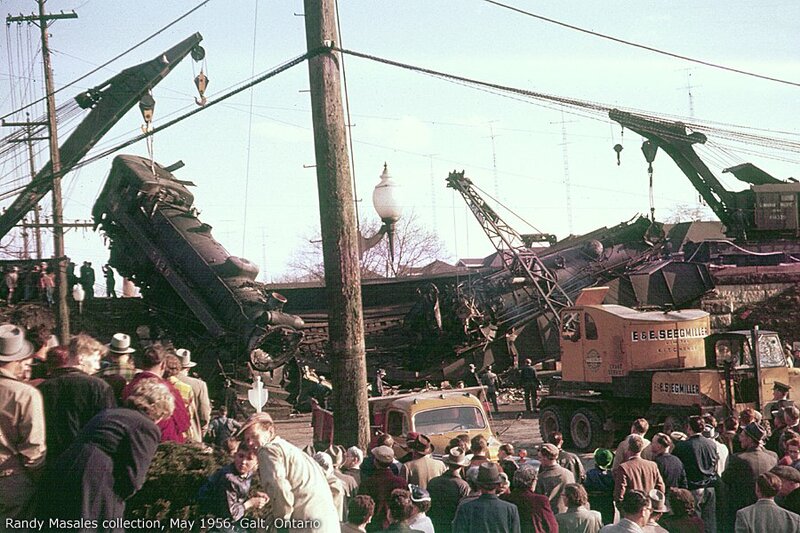 For another look at 2205 prior to the wreck, along with a P2 identical to 5420, read Newt Rossiter's story about 2205. Use your browser BACK button to return here. NOTE: Repeated attempts to secure a copy of the Board of Transport Commissioners investigation into this wreck have proven futile. The Archives of Canada claim not to have any such files, the Canadian Transportation Agency and the Transport Safety Board likewise deny having anything. The above mentioned BTC investigation would clearly identify who was where and the names of each of the crew members; remember there were 14 crew involved! It would also answer other questions (including the number of the extra's assist engine, believed to be either 2206 or 2607). How long was the Extra in the clear before coming back out onto the main line? Although these questions are really of no matter since the careless disregard of the rules resulted in the death of two innocent railroaders. Unfortunately, such was the way of the times. Today, railways and railroading are much safer thanks to a stricter adherence to the rules and the "black box" event recorder on all diesel locomotives.